Mixer with a bottom discharge system. The dough is unloaded onto a conveyor belt or into a moveable bowl. The mixing system may entail eitheran MD-Line spiral or dual tool (MDW-Line). 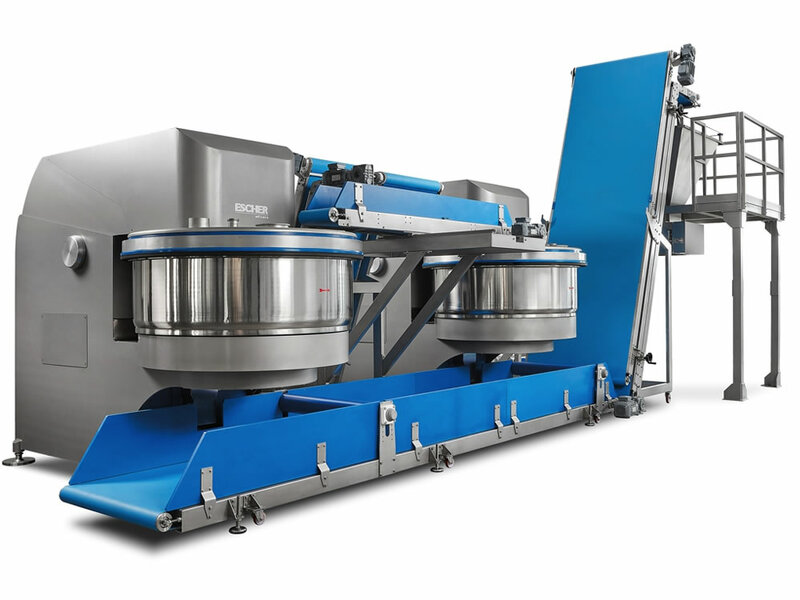 This compact system features two or more series of mixers that feed the dough directly into the production lines, while an optional extension offers a system for letting the dough rest. The machine was designed with special attention paid to various aspects of hygieneand functionality. In particular, the cleaning of the bowl closing cap was a priority. The bowl transmission guarantees constant rpm to improve the quality of the dough. The same transmission was conceived to last longer and requires less maintenance compared to the classic clutch wheel transmissions used in this sector. The mixer is available with a series of optional accessories, like the Vario Drive System(VDS), which allows the user to regulate the speed of both the mixing tool and the bowl.